Our Amish woodworkers believe deeply in the concept of the simple thing done well. This Manchester Hall Table - hand-sanded to an incredible shine in a small Amish woodshop in the northern United States - is an ideal example of that time-honored dedication to subtle perfection. Its wide size, versatile height, and full-extension drawer bring home-wide versatility to the Manchester's beautifully traditional design, while its solid wood construction and handcrafted joinery ensure that the Manchester will bring decades and decades of strong, stable use and enjoyment to the home. 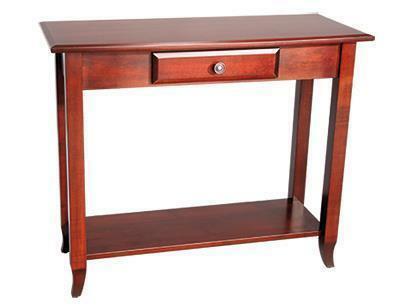 Your Manchester will be handcrafted in your choice of wood and stain. Simply select your ideal combination from the menus above, and if you have any questions at all - or if you would like to see samples of any of our woods and stains at no extra cost - please don't hesitate to reach out to us by phone or by email anytime. Our goal is to bring every detail of your vision to life, and we would love to talk to you about the inimitably traditional elegance that the Manchester range brings to the home. Shown in Brown Maple wood with a Rich Cherry stain. Quality Takes Time – Typical Build Time for This Piece is 10 to 12 weeks.